Capture Central Oregon sunshine and use it to heat your domestic hot water. The most comfortable, efficient heating systems you'll never see. INFLOOR HEATING SYSTEMS are the most comfortable, efficient heating systems you'll never see. 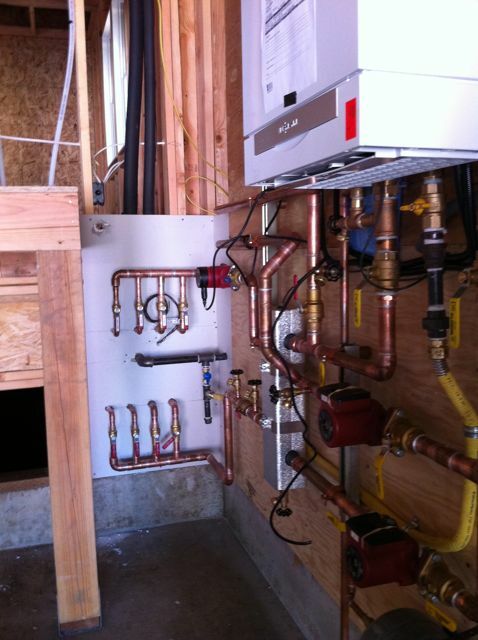 Once your hydronic (water) system is installed, you can choose from a variety of heat sources to deliver the energy for total home comfort. Gas, electric, oil, solar, wood, and updated technologies like GeoThermal heat pumps, Air to Water heat pumps or wood pellets provide you with many options. Get creative with your comfort! Areas like walls, ceilings, benches and hearths, garages and greenhouses as well as the floors in your home or business provide an opportunity to install radiant heat. Since 1977, Bobcat & Sun has been providing Bend Oregon businesses and residences with the most comfortable and efficient heating systems available. Are you thinking of installing a solar heating system? As your local solar and radiant heating specialists, let us provide you with a free estimate for your home or business. Three hundred days of sunshine every year are typical in Bend Oregon and the surrounding communities. Imagine having a morning shower and doing the dishes using solar heated hot water generated from the previous day of sunshine. You take off to work and so does your solar water heating system. It chugs along once the sun hits the collectors and keeps on running all day long. When you return home from work your solar storage tank is full of one hundred and fifty degree hot water heated by the sun. When you use your hot water that evening and into the next day, the solar storage tank refills with cold water and the cycle begins again automatically. The solar water heating system literally reduces your energy costs and you'll never run out of hot water again. This is tax free income in your pocket and it works for you every day. So the more hot water you use, the more you will save! Bobcat & Sun installed a drainback solar water heater for me in 1984. This system is still running with only 2 visits in the last 25 years to do routine maintenance. They are very dependable, do the work efficiently and they really know the business. They also patiently explain how things work. I consider the system I have to be a great value. Also, I like hiring local talent and keeping the money I spend local. Think solar, act local! I heartily recommend Bobcat & Sun for any solar work you are considering. Bob, here is an update on the efficiency of our house. As a reminder, our house is 3,000 square feet on the main level and 2,200 square feet in the basement. We used ICF construction, radiant heat throughout, boiler system for hot water with endless water tank. We use gas for cooking, heating the house, and heating the hot water. With a family of five, we average 3 loads of laundry, 6-7 showers, and a dishwasher load per day. Because of ICF, we do not have air conditioning, but use air circulation to keep fresh air in the house. Here is the beautiful part of the radiant heat. I have a 1,000 gallon propane tank, which holds approximately 800 gallons at capacity. I fill it about every 9 months. That is approximately $177 per month. "Bob, I also want to thank you for your professionalism. When doing my research on radiant heat, I was told by others that you were more expensive than the competition, but the service you provided was worth it. Truthfully, your bid was higher than some and lower than others. But they were correct about your service. It has been without reproach. Your employees have been courteous, knowledgeable, and dependable. I think Pat and Jim know more than you do. Anyway, thanks again for all you have done to make our home enjoyable. It is a pleasure to recommend the work of Bobcat & Sun, Inc. They installed a boiler for our log home about nine years ago. The work was excellent - highly efficient. It has run without a hitch ever since, heating our driveway and the floors throughout our home. We have been extremely pleased, and I would work with Bob Claridge again in a heartbeat. He is honest, thorough, and extremely knowledgeable. Any time I call with a small question, he makes time for it - and really knows his stuff. I feel we were very fortunate to work with Bobcat because every detail of our home was important to me - and Bob made sure things were done right. His work is matchless and he is the consummate professional.